Do you ever go to conferences or meetings with your notebook in hand, come out feeling inspired and motivated – but then come home to reality, a pile of notes, and a feeling of overwhelm? In today’s video, I will help you turn those notes into action! We have “piles of notes” from conferences & meetings – full of great ideas and thoughts that we wanted take action on but haven’t. When your brain is presented with 50 options, it has a hard time prioritizing and making decisions. Our goal with these frameworks is to create a simple place for your brain to focus. 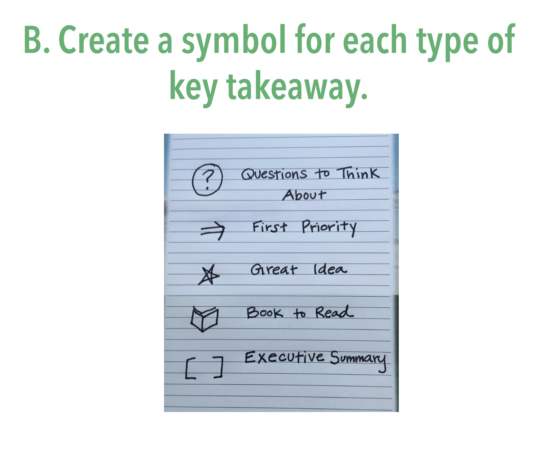 The note-taking framework will shape the way you take notes while at the conference. You will come away from conference with a simple list of actions and ideas. Click here if you’d like to download your own copy of this template. I have gone to a few conferences each year for several years. At these conferences, I’ve met so many people that say, “I come, take notes, and don’t do anything.” That can become so discouraging! 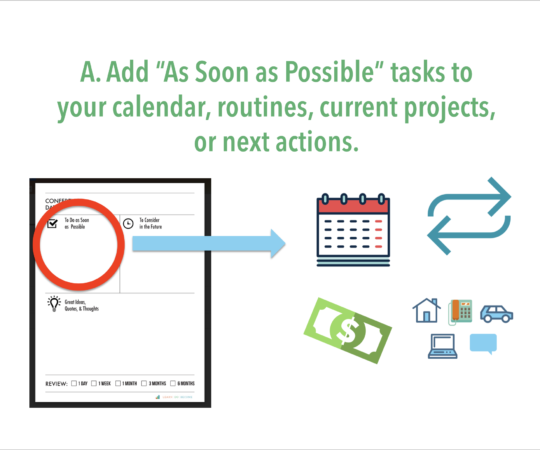 In the implementation framework, you learn to utilize a streamlined calendar, automated routines, and a super short next actions list. I have included some of the basics here, but if you’d like to learn more, we’d love to have you join our free class, “How to Finally Stop Drowning in Piles,” where we will teach you four simple steps to get you out of overwhelm right away. Often at conferences we get great ideas to start a new routine, or improve one of our current routines. 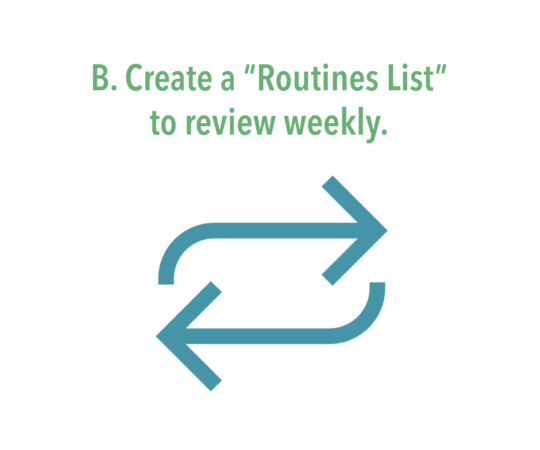 This “Routines List” gives us a place to add those ideas. 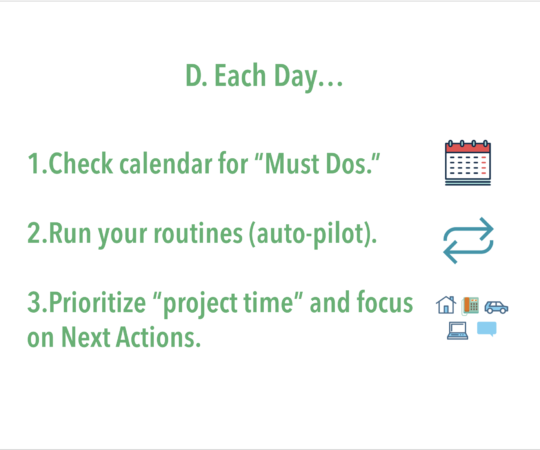 Don’t stress about getting this perfect – feel free just to write your current routines, print and post it. This is what I have done for my personal routines. 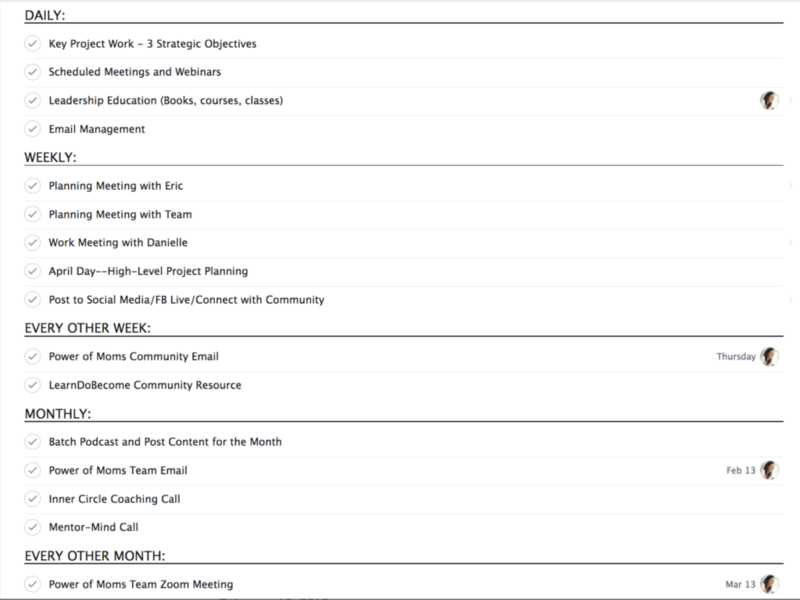 I like to view my Routines & Responsibilities list as the ideal, not something set in stone. Would you like to learn more in depth about how to run solid routines on autopilot? Learn how you can participate in our free training here! When you work on 20 projects at once, you don’t get any of them done well. We are human – and humans can only work on a few things at time without facing overwhelm. 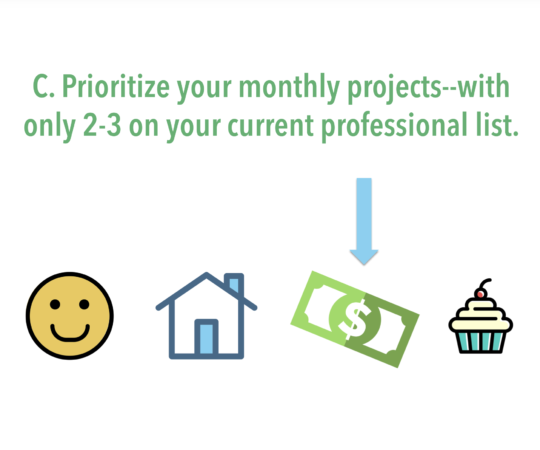 But don’t feel like you have to completely drop those projects you aren’t working on right now. 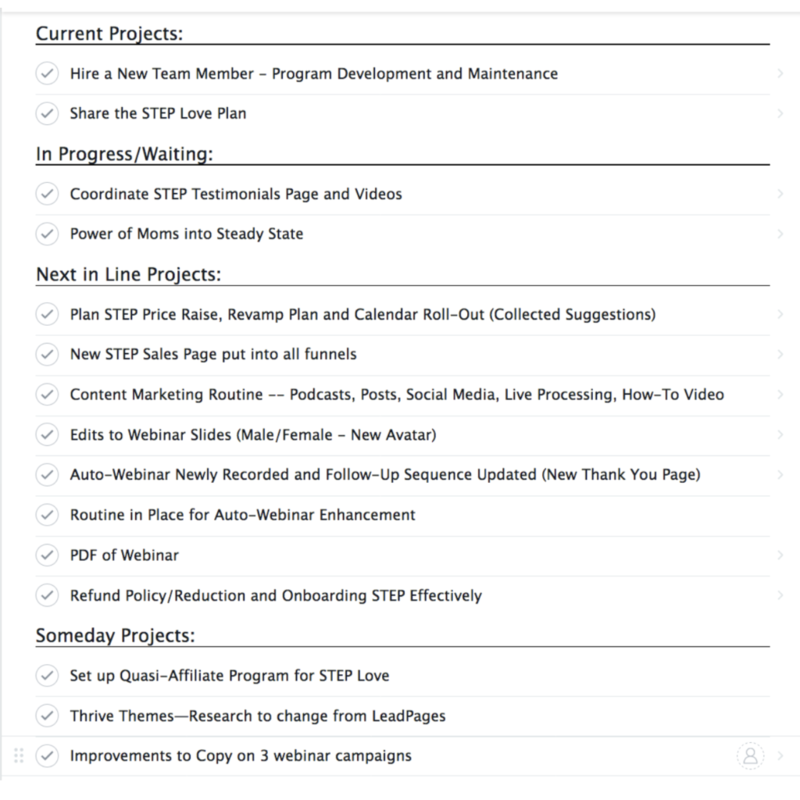 As you can see in this picture of my work projects in Asana, I keep a list of Next-in-Line Projects and Someday Projects – so that as I work my way through projects, I always have my next ideas ready to go. For my specific Context-Based Next Actions list, I keep my work actions in Asana. But for my personal next actions, I have a super simple, color-coded list of flexible next actions I can work on throughout the week that I have written out and keep in my planner. 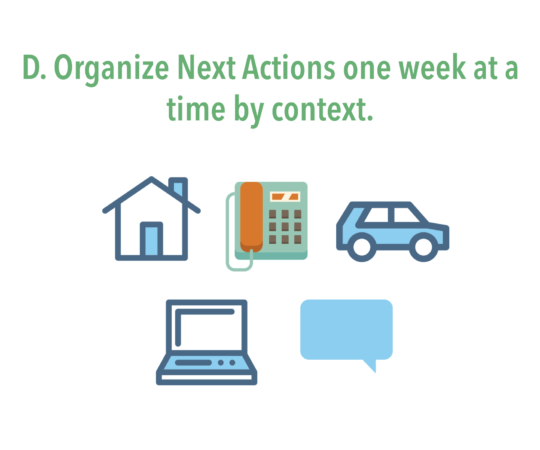 We go into the Context-Based Next Actions list into much more detail in our free class, “How to Finally Stop Drowning in Piles.” We’d love to have you join us! 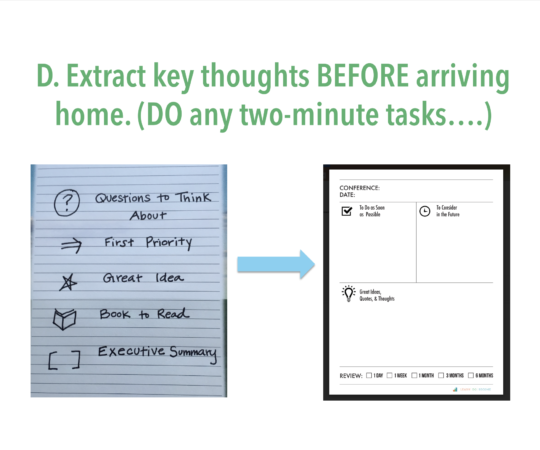 This is where you take your note-taking framework and your implementation framework, and use them both to actually start to get things done! 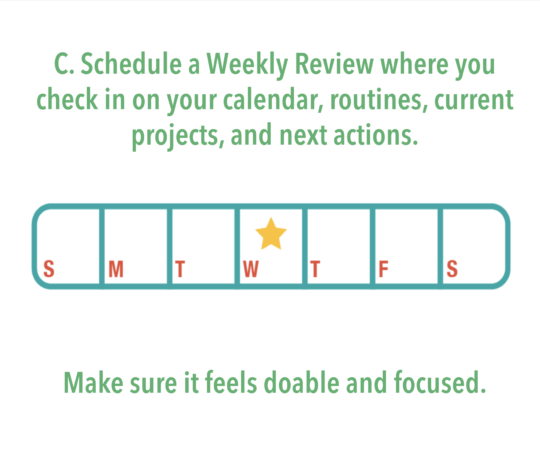 When you review your notes, you will be able to mentally go back to where you were when you were at the conference. You will be reinvigorated, and your key ideas will become part of who you are! 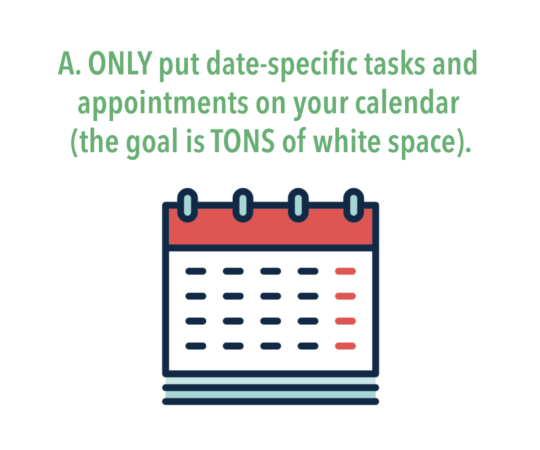 I hope that these frameworks will help you combat the overwhelm you might feel just after a conference or meeting. By taking your ideas and breaking them down, you will be able to implement things you’ve “architected” months ago in your day-to-day life. I’d love to hear how your next conference or meeting goes. Share your experience in the comments below! We’d love to have you join us in our free class, where you learn four simple steps that will help you combat overwhelm, eliminate piles and create mental space for all those great new ideas you will learn at those conferences! Click here or on the picture below to view the upcoming class times! 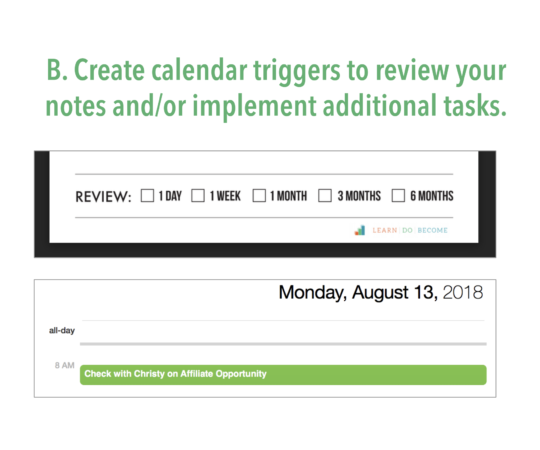 If you would like to listen to the podcast Eric and I recorded about “Three Ways to Get the Most Out of Your Conference Notes,” click here or on the picture below! We want to give YOU a special prize for helping your friends get organized. Click here or the image below to find out how you can get access to our free routines class and earn other great prizes! We’d love to have you join our online party! I feel silly, what does ROI mean in the title of this podcast? Also, when you speak of bandwidth what’s that? Hi Barbara, great questions! ROI stands for “return on investment” meaning that you are getting a great return or benefit from the investment of time and/or money that you have put into the conference that you’re attending. Bandwidth as mentioned here is the time and energy needed to complete a project. Thanks for asking and have a great day!! April- you’re awesome! 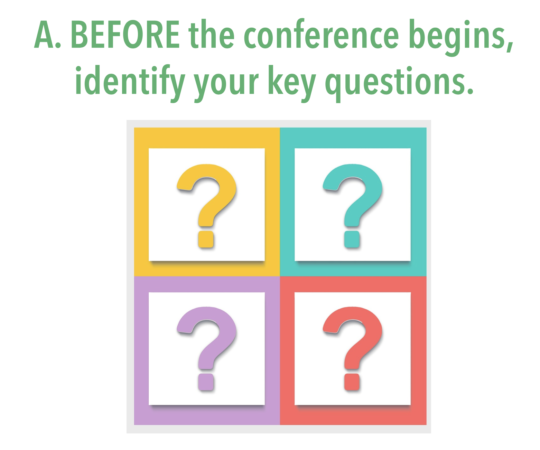 What a simple and much more effective way to get more out of conferences and be able to retain and apply more essential information without adding clutter. Thank you for sharing your expertise. I’m definitely going to apply your techniques for my conferences and I already know it will make a huge impact for me. Thank YOU! I love these ideas to speed up note taking implementation. I was using some of my own but you helped give me ideas for more that can make it even better. I recently went through 8 years of notes & files from one business and only kept what I wanted and still needed to keep (a little bit) and put the rest for recycle center. Yahoo yahoo! That’s amazing, Nona! Thank you for taking the time to comment here to share your success. Keep up the good work!! Where do you store your Executive Summary sheets? 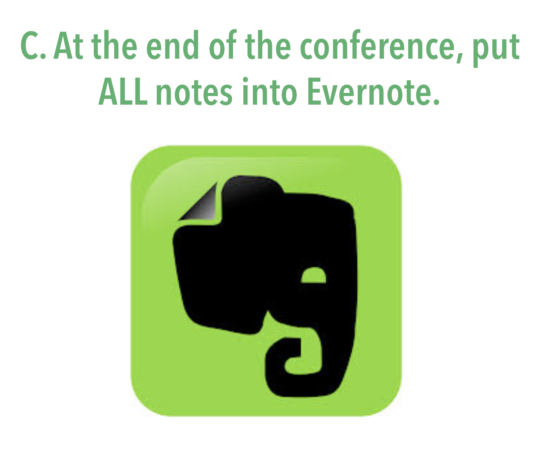 Do you put these into Evernote or are you keeping them on paper? Have you looked at Simpleology? Hi Felipe! We’re not familiar with Simpleology. April loves Asana for keeping track of her projects and lists of things to we. We highly recommend it!